What are the beginnings of emotional object constancy? After the child resolves the conflicts of the rapprochement stage, the child enters the sub-phase of the beginnings of emotional object constancy. In this sub-phase, the child consolidates a representation of the mother, in which the mother can have both good and bad features at the same time. Children can feel both anger and love toward their mother without fearing the loss of their relationship. Even when they are angry at their mother, children can remember that they still love and need her. This integration of positive and negative features supports the child’s internalization of the mother, an achievement that gives children much greater control over their emotions and their behavior. As the positive memory of the mother can now withstand the storm of the child’s negative feelings, the child is less afraid of the loss of the relationship. The child is at the beginnings of emotional object constancy as the capacity to keep both positive and negative feelings toward someone in mind is a skill that is far from mature at two years of age. In fact, this hallmark of psychological maturity remains a challenge throughout the lifespan. Temper tantrums are a hallmark of the toddler years. 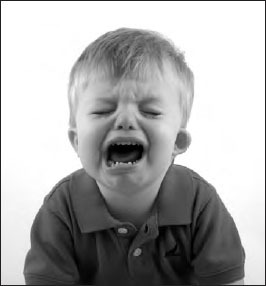 Although infants can certainly get very upset, they do not throw temper tantrums per se. While frustrating for the parent, the onset of temper tantrums is actually a sign of cognitive development. The child has become aware that he or she has a will and that this will is being thwarted (iStock).